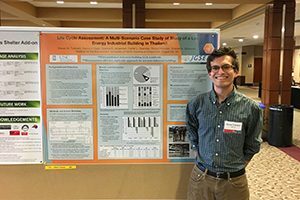 To advance our missions in undergraduate education, environmental research and community outreach, the Institute, in partnership with the Environment, Ecology and Energy Program, has established a network of field sites with locations in North Carolina and abroad. The site locations offer a variety of ecosystem settings ranging from the mountains to the coast to urban settings to tropical rain forests. The field site program is coordinated through the Study Abroad Office of the College of Arts and Sciences. Each site focuses on themes specific to that community or region and provides a semester-long opportunity for students to explore real-world issues through a combination of course work, field trips, group research projects and internships with local organizations. Challenges facing host communities help shape the curriculum at each site, and the results of research by UNC-Chapel Hill faculty and students are shared with community partners. The UNC Study Abroad Office in the College of Arts and Sciences coordinates applications for attendance at all Institute field sites. For more information on any site, select from the map below. 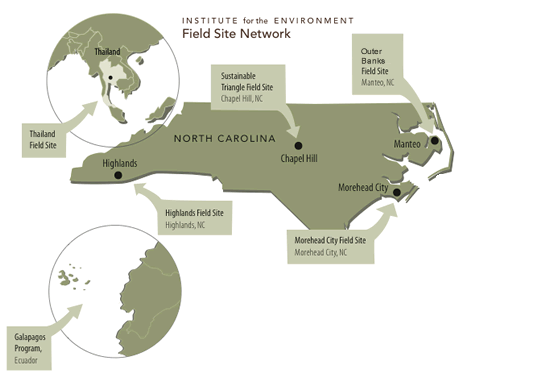 For more information on any aspect of environmental field sites at Carolina, contact the Institute’s Office of Field Sites led by Director of Student Affairs, Greg Gangi. His office is located on the 3rd floor of Whitehead (Room 312), adjacent to the Carolina Inn.